So after a fun filled Sunday morning of homeware shopping (I am now the proud owner of a drying rack..), I headed over to my friend Robyn’s to hang out for the afternoon. Singing along to numerous a cappella groups on youtube at the top of our lungs, *cough Pentatonix cough* amongst other things, Rob asked me if I’d ever heard of ‘Winnie Harlow’, of who I hadn’t, and I’m bloody glad she asked. After scrolling through every one of Winnie’s Instagram pics, I am now a woman obsessed. And I’m sure you will be too. Winnie (also known as Chantelle Young) is soon to be on the next season of America’s Next Top Model and I think that after her exposure when the show is aired, she will blow up and become one of the biggest names in the modelling biz. If you haven’t already guessed which one of these posers I’m talking about, (Side note: why does Tyra always look so MENTAL..?) Winnie is the 5th beauty from the left, with the skin condition Vitiligo. Vitiligo is a condition where there is loss of skin pigmentation – causing white patches to appear on your skin. These patches can grow and change shape and things such as sun exposure can speed up or increase the spread of these white patches. Vitiligo can effect people of any ethnicity, but it is more obvious on darker skin tones due to the dramatic contrast in skin colours. 50% of people with Vitiligo are affected before they reach their twenties, and this includes girls like Winnie – who when born, had no signs of the condition, now at 19 years old has large areas such as her stomach and the underside of her arms covered in white skin. Your teenage years are always an awkward mess (I know mine were) and filled with insecurities, so I can imagine for Winne her early teenage years dealing with this very obvious skin condition must of been hell. 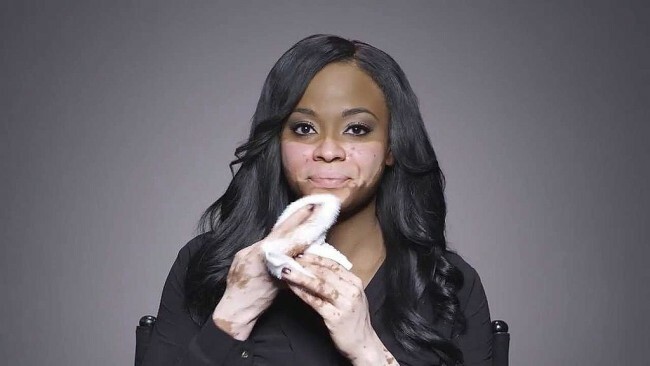 With her Vitiligo starting to appear when she was around three, she’s talked about being bullied mercifully and even coming close to suicide. But look at her now. Gurl, you fine. I mean she it helps she is naturally stunning, but I feel what makes her even more attractive is her self acceptance. For her to pursue a modelling career, which obviously is based around you appearance and having your picture taken, she has got to have a hella-load of confidence. You go gurl! I think what makes her Vitiligo all the more striking is the symmetry of her light patches. Besides her face, her arm patches make a near perfect line of black and white down the middle, and her knees are both affected by Vitiligo equally. 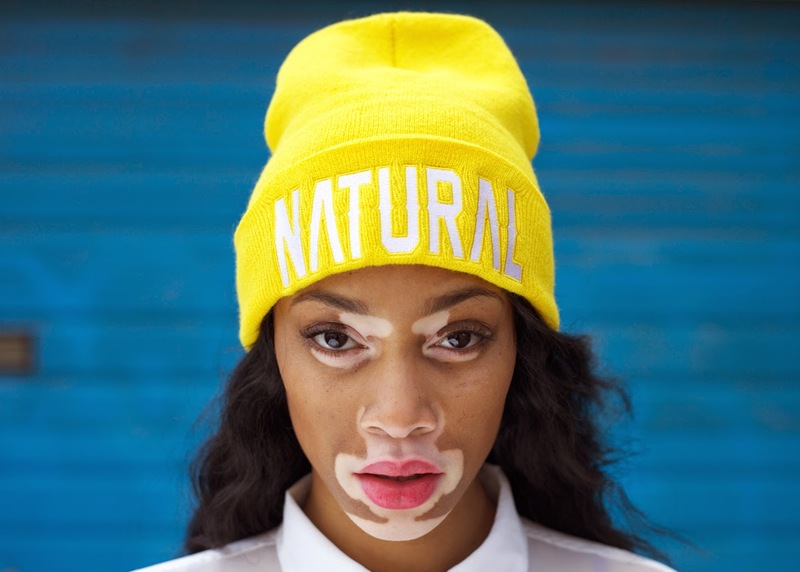 I think she looks awesome and being on ANTM will hopefully bring positive attention to Vitiligo sufferers. Winnie herself has said that she wants to inspire and educate others about her condition, and that she most definitely will. Tyra Banks (the original crazy eyes) always wants to push the boundaries of beauty on the show, and I think through Winnie she will definitely be achieving this. Follow her on Instagram & Twitter at @winnieharlow. Go team Winnie! Where Winnie isn’t afraid to show off her skin, others would prefer to cover up. Recently videos in the ‘Camo Confessions‘ series went viral featuring different individuals exposing their true selves and telling their stories. 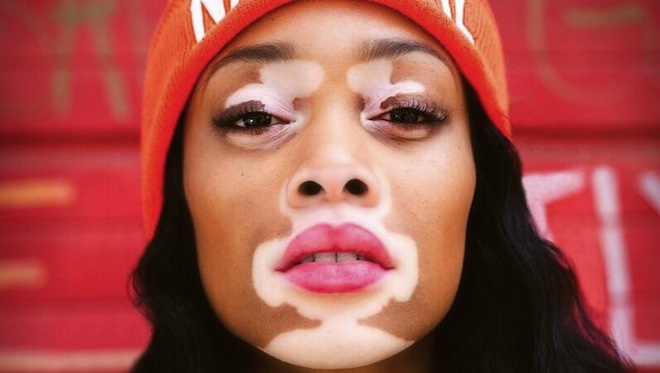 From a girl suffering from acne, to a model covered head-to-toe with tattoos, one of the people featured also Vitiligo. 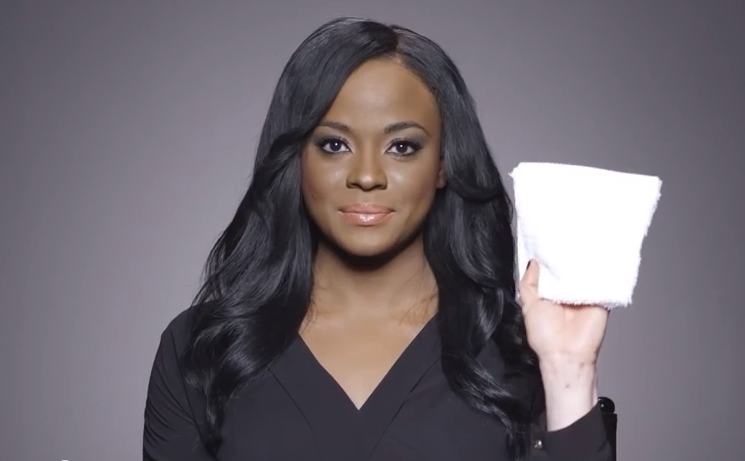 The vid starts off with Cheri – who seems to be a normal, pretty black girl, start wiping her face exposing large white areas. She talks about her life with the condition – it’s actually unbelievable the questions she says she gets asked, like ‘is it contagious?’ (douchebags!) but Cheri is adamant that her Vitiligo hasn’t dented her ability of success. I guess each to their own if they want to cover up what they consider ‘a flaw’, it’s just the same as anyone wearing makeup really. Watch the video here. So these girls are my July inspiration, I hope to have an inspiration post at the end of every month based on something or someone that has caught my eye, with the intention to shed some light on something a bit different. Now excuse me while I never complain about my skin again.